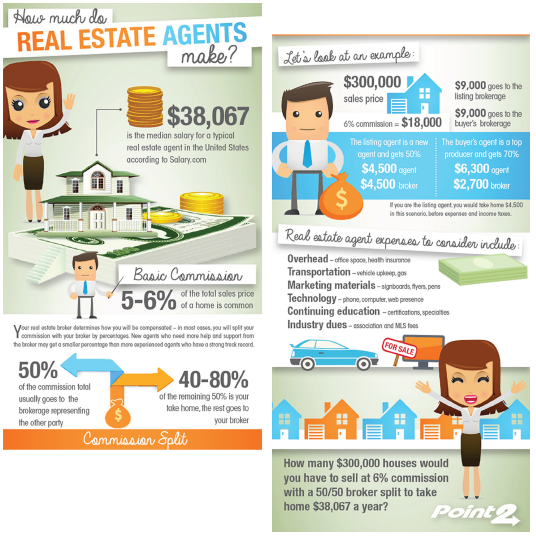 Some folks never put much thought on how realtors and real estate agents make their money. You will find professionals who receive their fees elsewhere and not from the buyer while some get a commission from their sale. But once you are decided to sell your house or buy a new one, this is usually the time when people start wondering how do realtors get paid. At times, buyers get surprised when they learn that realtors and agents get their commissions from the selling side of the deal. What this means is that the fees get negotiated between the seller and the listing broker. When the house is sold, the seller’s agent splits the listing fee that the seller paid with the buyer’s agent. You must also know that there are some agents who represent their buyers for a flat rate. There are also some agents who work on an hourly basis, but this business model is not popularly used. So far, the most common practice followed by realtors and agents is the commissions being split between the buyer’s representative and the listing broker. The normal process of buying a house starts with the buyer’s agents showing their clients some of the homes listed for sale. Usually, both the prospect buyer and the realtor visits the property and assesses whether it is a place they want to buy. After this, an offer is made through a residential purchase agreement with an earnest money deposit. Assuming that everything goes smoothly and both parties are on the same page, the deal will proceed to the closing stage. The closing stage is when the escrow, or also called a neutral third party, handles the money. Once the property is paid, the commission will be split into two, which are then disbursed to the agents directly or to the companies for whom the agents work for. When it comes to the responsibilities of real estate agents, only brokers can list homes on the market. Even if you work with an agent and agree on the terms, their broker is the one legally holding the listing. Which means the broker also gets a percentage of the money paid by the seller of the house. Brokers will naturally get some type of commission from the house sale. After all, they are in charge of listing the home and of marketing it as well. For brokers, their typical fee is usually from 5% to 6% (which is then shared to the agent as the realtor’s commission) as a reward for listing your property and marketing your house. They do this by posting property listings on their personal website, official website, internet ads, mailers, yard signs, and print publications. They also handle the telemarketing and social media exposure of the property. Not all real estate transactions are made equal and the real estate agent fee is part of the equation. That is why you need to do your own research before embarking on such a big investment so that you understand all the costs associated with such a deal. A lot of money can be made in real estate, but some people have lost money as well. So pay attention and do your homework. Renovating your kitchen is not always as expensive as you might think! The proof, these 7 ideas for the renovation of the kitchen will help you save while realizing this project which is important to you. Be inspired by these solutions and most importantly, take notes. You could renovate your kitchen on a budget soon! At the center of your kitchen, the island is a unifying element and it is very useful. It is used as an extension of countertops, as a bistro table, as storage space … If you plan to change your table, reuse its flat surface to make it an island, which will help you renovate your kitchen without spending too much. When attacking the kitchen project, we often think of changing the cabinets completely. The least expensive solution here would be simply to choose a nice neutral color to repaint the cabinets already present. The kitchen will immediately take on value! And if in your kitchen, it was only the handles that were closing? Never mind, it will cost you a few dollars to choose new handles to your taste, which will marry better with the spirit that you want to see emerge from your renovated kitchen. Nothing like a beautiful floral centerpiece, a hanging flowerpot or a huge fern to change the atmosphere and atmosphere of a room! Think about renovating your kitchen to decorate plants, to lighten the air while giving a new vocation to some unused places. In this day and age, the greener the better. Some plants can add a great smell to the room and they provide a more natural look. When you decide to renovate your kitchen, several materials accumulate as work progresses. Whether it is wood scraps or ceramic, metal parts or plastic, put it all together and see how you can use them to jaze the room even more. This is case you have mace a small scale kichen remodelling. But if you are really changing many things, even tearing down some walls, then you may have a lot of debris, and you mighy need to rent a dumpster just to get rid of them. Another option, a little more laborious depending on the tiles chosen, is to modify the backsplash. Whether you decide to repaint it or change the ceramic, the backsplash alone can greatly change the look of your kitchen. Be aware that there are much more affordable sticker models that you can easily remove and change. All you have to do is list your options to renovate the kitchen! Get started now. Over a billion of people are now using the Internet every day. Even the third-world countries that need some digital upgrading are slowly catching up – such as Africa which has one of the fastest growing rates. Because of this, on top of more affordable smartphone devices today, social media continues to grow rapidly as well. Social Media by far is the most popular service on the internet today. People do not just use them for personal purposes, brands utilize them as well to advertise their products and spread awareness. Today, Facebook has two billion monthly active users and continues to be the most popular social network by far. However, due to a number of different trends, Facebook is only the number one social media website in 129 to 137 countries. China, in particular, does not use this medium. In fact, Twitter and Instagram – both owned by Facebook are also blocked in this country. China is the most populated place on Earth. If you think about it, anything that is popular in this country can statistically overturn any other trends after Facebook. In this country, they use QZone. It is a social media network with 632 million active users as of the year 2017. After Facebook, Instagram takes the lead of 600 million active users. This is actually the social network that comes in second to Facebook in the United States and most of the Western Europe Countries in the year 2017 as well. What is the recent update on Social Media Popularity for 2018? Dreamrow.com has combined multiple reports and data on social media sites, and according to them, Facebook has about 2.2 billion active users as of March 2018, Youtube now stands at 1.8 billion, and Twitter comes in at third place with 336 million active users on the first quarter of this year. In conclusion, the top three social media platforms for 2018 are Facebook, Youtube, and Twitter. So, what makes these three platforms so popular and successful? Some people may beg to differ, but Facebook is remarkably simple to use. Because its creators have made it user-friendly, almost anybody at any age can start using them within hours. Facebook is used to express and share real-life experiences. And because its purpose is very social, people no longer use them for personal use only. Businesses, brands, and even government organizations have used them to share news, advertise products and market brands. People can easily post their feelings, share emotional videos and recommend various businesses to their Friends List. Youtube is a video platform for content creators. It has a wide plethora of viewing options where people can gain information about beauty and lifestyle tips. This is where people primarily go to find tutorials, reviews, and DIYs. Because the content creators here enjoy all the creative freedom on how they produce their own videos, they establish a more personal relationship with their viewers. The video blogs or commonly known as “vlogs” give this site an edge over the mainstream media. With billions of channels, people can watch, you can count on that there is always something new to watch. Just like Facebook, Twitter is user-friendly. You just have to input your status or message and hit the update button. Furthermore, its interface is as simple as it can be. You can easily view the tweets of your friends and stay updated with any news outlets that you are following. Even the leading traditional publications such as the Time Magazine or the New York Times have adopted Twitter as a means to spread the important and relevant news. On top of this, celebrities use Twitter as a medium to reach out to their fans. In 2018, almost everybody has a profound understanding of what social media is all about. For some, it is a platform to express their own opinion, while others use it for their business advantage. They have definitely changed the way people, and organizations interact with one another.